The F1 2008 will be zooming into Malaysia this March 21 - 23! Even as Malaysians begin to get excited with the impending arrival of the drivers and teams here on our shores, the chance to meet any of the F1 drivers in a face-to-face session remains a dream for many. This is where Honda Malaysia is making this dream come true for 20 winners of the "My Challenges & Passion in Motorsports" short essay writing contest. Honda is inspired by dreams and reaching for these dreams. To inspire Malaysians, especially the students of the Otomotif College (TOC) to do the same, Honda Malaysia is collaborating with the college on this essay contest that creates a chance for these students to fulfill one of their dreams - to experience the F1 and to meet the F1 drivers. "I am very pleased that Honda Malaysia is organizing the F1 motorsports essay contest and most importantly have invited all the students of The Otomotif College to participate. Personally, I highly encourage our students to participate in this program because it is a golden opportunity for students to see the real world of F1 motorsports where innovations and safety are of primary importance. This will also motivate and challenge the students to the next level of competency and ability," said Principal of The Otomotif College, Encik Mohamad Aripin Harun at a ceremony held recently to officiate the contest. To motivate the students, Honda played a video showing Honda's "Earthdreams", its RA108 F1 race machine as well as showcasing the challenges and the Challenging Spirit of Honda in motorsports throughout the years, at the ceremony. 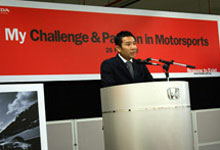 Mr. Go Suzuki, Head of Marketing of Honda Malaysia said, "Honda believes in dreams. In order to make dreams come true, we must have the Challenging Spirit to overcome challenges. Armed with this fundamental belief, Honda Malaysia now wants to spur TOC students to reach for their dreams by providing this opportunity to meet Honda F1 drivers as a motivation." He added, "Motorsports is in Honda's DNA. It is Honda's reason to exist. As an example, Honda Racing F1 Team failed to win the race last year. We understand winning is a great challenge for us, but improvement is our main concern and defeats always challenge us to work harder." Motorsports for Honda, is a platform for human development, to improve skills to a higher level of new value creation. Hence, for this contest for F1 which helps turn students' dreams into reality, it is working with TOC, an institution that specializes in producing skilled technicians and engineers who will one day be creating new values in their respective field and organization. For the contest, TOC students are required to write a short essay on "My Challenge & Passion in Motorsports" sharing their dreams, and their own challenging spirit to overcome challenges in their language of preference. Twenty best essays will be awarded with an exclusive "Meet the F1 Drivers" session. The evaluation of the essays will be conducted by Honda Malaysia. These winners also stand a chance to grab one of the ten exclusive Race Pack which include a Grand Stand ticket each to catch the 2008 Petronas Malaysian Grand Prix at Sepang International Circuit. One of the students of TOC, Ng Kah Huat, 20, said "I believe motorsports is a true test of the performance of the cars. Personally, I like car races. Ever since I was 15 years old, I have always dreamed about being a racer one day. I am very excited about the contest organized by Honda Malaysia because if I win, it will be a dream come true for me to meet these great race car drivers." Another student, Kanapathy, 21, commented excitedly that motorsports is about the thrill, the drama and the performance of the engines. This contest is a great opportunity for him and his fellow friends in the college. He loves the sound of engines and the performances in motorsports. Kanapathy dreams of producing the best engines for race cars one day. At the end of the ceremony, a contest briefing and Q&A session was held to answer any questions the students have about the contest. In tandem with its motorsports involvement for human development, Honda Malaysia will continue to seek out platform to spur Malaysians to a higher level of achievement in skills development.